Just wanted to check in and share something I've wanted to share for a while but kept forgetting to: my kids watch TV. Isn't that just scandalous? I bet you thought they spent all their time doing wholesome stuff like crafts, trekking, outdoor treasure hunts and reading old classics. Well, hah! We don't leave the TV running all day, and the kids are supposed to clear up their toy mess of the day before they get to watch TV, but yes, they watch TV. Mostly they watch movies and sometimes on the computer or laptop. And sometimes they see adverts and want some new toy at Target as an unhappy consequence. And when they were little, they even watched Barney. And we even sang the Barney songs together. As a new mother, I used to roll my eyes and feel I'd die if people found out (especially about Barney) but that's life. And I celebrate all of it because it was part of my children's childhood. I think I turned wise after I started getting enough sleep again. Today I want to share a kids' show that the girls love and that I think is awesome. 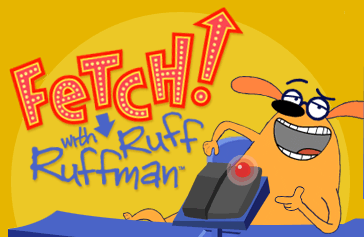 Have you watched Fetch with Ruff Ruffman? It's zany, which is how I like my kids' shows. It's a quiz show helmed by an animatronic dog Ruff Ruffman, with real life kid contestants who earn points by doing tasks. The kids meet and work with people in an amazing array of occupations and fields to learn things. It is awesomely educational and even funny. The things they learn! And what a theme song! When PBS stopped airing it on TV, the kids found past seasons archived on the website here. Just as an example, one episode in Season 3, called The People vs. Grandma Ruffman, involved Ruff's Grandma being accused of a crime and whom the team of kid constestants were tasked to defend and prosecute in court. The kids met with various professionals, including a prosecutor, a defence attorney and a forensic chemist to gather evidence, question witnesses and build their case. Love it. 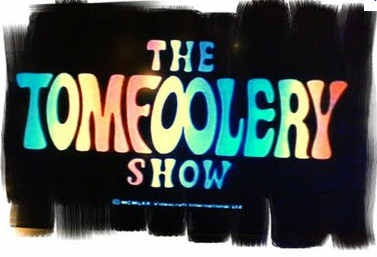 And does anyone remember The Tomfoolery Show? It was an ancient animated series that I loved as a kid. It's a great intro to the more zany works of Edward Lear and Lewis Carroll. I learned all my limericks and poetry and nonsense by watching it. I credit my ability to write silly verse like this and this to childhood influences like this show, along with some daft books I forgot the titles of. Read a little more about The Tomfoolery Show here. And while we're on the topic of kids' entertainment products, I am about halfway through Book #9 of the Sisters Grimm series. Argh! It is so hard not to abandon all my (supposedly) adult responsibilities and just devour the whole wretched thing in one afternoon. I made myself wait 24 hours before starting on Chapter 1, just to see if I could do it. Then I made myself sew scalloped bias tape for three hours straight last night before allowing myself to read Chapters 2 and 3. I am the most demented person I know! I love Fetch! At first I thought the dog thing was strange, but you are so right about the cool things those kids learn about. I'm the same way with books. I'm almost afraid to pick up a new one, because nothing will get done until the book is finished. I'm just like that. We LOVE Fetch around here, and then we hear about everything they learned all day. Wild Kratts is another show that the kids get to watch, I love hearing what they learn about the animals. I love The Sister's Grimm. I think I've read the first three books. I do so love Granny. I was totally with you - reading this post and the last one ---having experienced every manic moment myself . . .until you mentioned scalloped bias tape. Why are you sewing scalloped bias tape??? We've never watched Fetch, although our local Children's Discovery Museum has hosted a few fun science projects for the kids based off of the show. Actually, I've never seen any of your recommendations - will be checking them out! We also love Wild Kratts, other favorites have been Kipper, Blue's Clues, Between the Lions, Wild Kratts, and Word World. And Emma ADORED signing time - she had quite the sign language vocabulary from that one (over 200 words!) Johnny and Lily never got into it, for whatever reason. 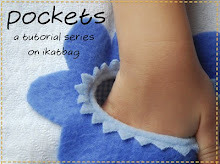 Scalloped bias tape? Sounds a bit like torture! Did you ever see Bill Nye the Science Guy? Lots of fun, cool science and a great (?) theme song! This post has me laughing hilariuosly. I adore Fetch and wish it was on in the afternoon (so I could watch when I get home from work). Neither me or my sister have any kids and we both love Ruff and Blossom (especially Blossom when she's rolling her eyes at Ruff). PBS is a great resource for super cute kids shows. I also recommend "Dinosaur Train". We love Fetch here as well. My 7 and 10 year old watch certain episodes over and over again. Too bad there are no new ones. 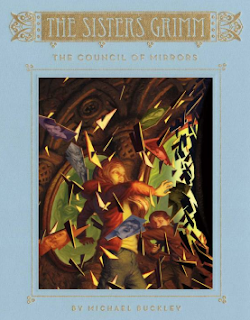 Can't stand it any longer - you've mentioned these books several times now. I just reserved The Fairy Tale Detectives from the local library. Curiosity got that cat and me... Thanks for your blog. 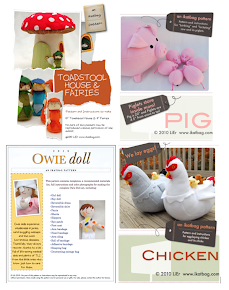 I'm renewing my love for sewing after a very long absence and am very glad I found your blog!! My kids love watching Fetch!! Thanks for letting me know the last Sisters Grimm book is out! I just picked it up from our library. I was all excited for my kids to watch the Fetch show you recommended but unfortunately the PBS doesn't allow us Canadians to watch it from its website. Perhaps some local carrier has it. My kids (elementary school aged) haven't watch TV in quite a while, but they do like to watch movies from time to time. I'm sure once school is out the TV will become more of a draw. They do wish they could have play dates 24/7 though. Try Jasper Fforde's Thursday Next or Nursery Crime series for your own reading list, Lorraine! Definitely right up your alley with being funny and zany. You just made my children very, very happy! They haven't seen season 5 (and I don't even know if they've seen season 4). We haven't had cable for years (not even PBS) and I had recoreded several episodes of it before that they love to watch. I know what they're doing this afternoon! I can only hope that you are making one of the many homemade nutella recipes that I have seen floating around lately. That or a dozen of something else fantabulous. PBS is about the only channel I let my kids watch. And as the mother of 2 girls...LOVE the Sister's Grimm. My daugter was distraught by who the bad guy is...but it led to a good discussion. And then she was distraught when we finished the series. Now I need a next round of books to read to her. Thanks for the link and for thinking of me, Angel! I love that video! PBS is such a wonderful source of great television for children. I am old enough to remember when Sesame Street began in 1969 and I watched it with my children. It amazes me that the songs from that show are still in this old brain. Television shouldn't replace reading,making things or playing outside, but sometimes, vegging out and watching television is O.K. I know many, many healthy meals were concocted while my young ones watched PBS. If parents choose properly, children can learn many great things from watching television. Parents should watch television with their children. Both my adult children are fantastic cooks and have ideal body weights. I would watch commercials with them and we would discuss all the lousy "food" that was advertised and I would explain that advertisers do not always have the best intentions of the consumer in mind. T.V. is a great opportunity for learning and teaching of values, but the parent has to be involved and monitor.